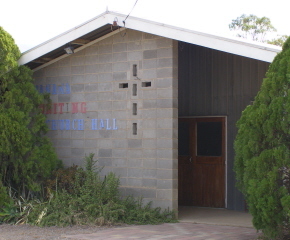 Banana Uniting Church Congregation worships on the 1st and 3rd Sundays of each month, from 9.00am, followed by morning tea. Sunday School is held on the 1st Sundays of the month, beginning with a short time with everyone in Worship. Banana Buddies, once a term – see Banana School Newsletter for details. For local information please phone 07 4995 7224. The Church is located on the corner of Bowen Street (also the Leichhardt Highway), and North Street, Banana.